Kleypas has a winner with the 5th and final installment of the Hathaway series. I have loved and adored this series since the first book, Mine Till Midnight. 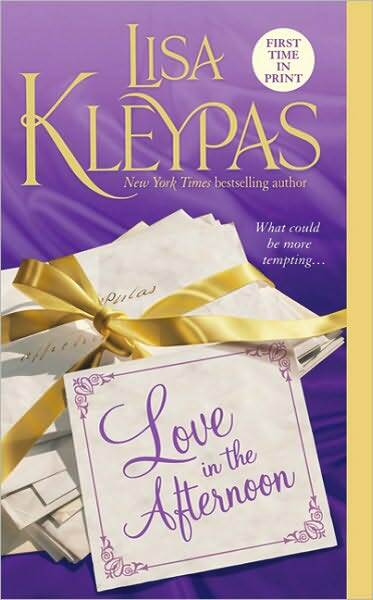 Kleypas in one of my favorite historical romance authors, and she does not disappoint! In Love in the Afternoon we finally get to find the happily ever after for the youngest of the Hathaway brother and sisters, Beatrix. She is a wild and free spirit, tending to care more for the wounded animals she finds out in the forest than she does for the pigs in the London ballrooms. On a whim, she writes a letter to Captain Christopher Phelan, pretending to be her friend Prudence. For months the two correspond, Christopher tells Beatrix all about the hardships of war, and Bea does her best to bring him a bit of normalcy with her letters. When the war is over and Christopher returns home, he is upset to learn that the Prudence he has come to love through his letters, is not the woman he thought she was. But once he spends some more time with Beatrix, he finds out that she was the writer of the letters. For Beatrix and Christopher, finding love is the easy part of their relationship. The hard part is finding a way to deal with the spoils of war, the heartache of loss, and the harsh reality of life. I have been waiting, somewhat patiently, for this book. I adore Beatrix, and think she is such a beautiful character with her love of animals and understanding of human nature through the study of animal behavior. She is this sweet and beautiful young woman with insight into so much more than meets the eye. I knew that she would require a special kind of man to love her and accept her. One of the things that Kleypas does best is relay the honesty in tough issues. In this book, she did an excellent job of showcasing the hardships of war. Christopher comes back with some classic signs of PTSD, and struggles with ways to handle it. He isn’t perfect after what he witnessed, and he has problems believing in himself again. The struggles that he goes through while sad and depressing, are accurate and beautiful at the same time. Plus, the way that Beatrix really brings him back to life is heartfelt. One of the other great things about this book is that the happily ever after really extends to everyone. There is no villain in this book, no one left down and out at the end, and to me that is special. While Pru was somewhat childish in her dealings with Christopher, she ends up happy. The rest of the Hathaway clan, while not very prevalent in the story line, are all accounted for and pleased with the path their lives have taken. I felt that this was a great end to the Hathaway series, and loved watching this family’s struggles and adventures. All in all, I give Love in the Afternoon 4.5 out of 5 pet hedgehogs! glad you loved this, I just bought it and can’t wait to read it!